Successfully Added Skyray S99 CREE LED Flashlight - 9 CREE LEDs, 9600 Lumen, Aluminum Body, 3 Modes, Range 100 to 200 Meters to your Shopping Cart. When it comes to brightness the Skyray S99 is one of the best LED flashlights on the market pumping out a huge 9600 lumens. 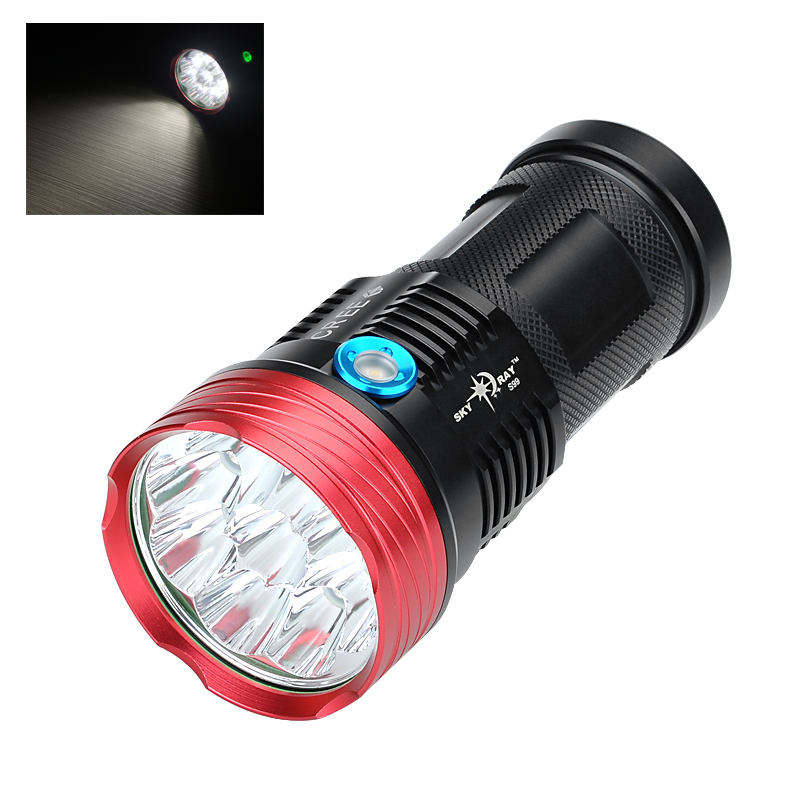 With 9 CREE XM-L2 T6 LEDs its able to shine its light on objects from 100 to 200 meters away making a suitable companion on any night time excursion. The S99 flashlight is powered by four 18650 batteries each with 3000mAh of power that provides a good amount of run time. Included with the torch is a battery charger letting the batteries be replenished when not in use. Benefiting from a aluminum body the Skyray S99 flashlight is built to last and suitable for accompanying you on camping trips, hikes, breakdowns or use around the house and with 3 modes can set to full or half power with a simple push of the switch or by holding the switch you can enable strobe mode. Perfect for disorientating any would be assailant, signaling for help or attracting attention. Constructed from a 6061-T6 aluminum alloy this tough flashlight is made to last and the 100,000 hour LED lifespan ensures it will be serving you well for years to come. The Skyray S99 Flashlight comes with a 12 months warranty, brought to you by the leader in electronic devices as well as wholesale LED lights.